Life as a shopping cart: it’s no piece of cake. | Infinite Space. InfiniteTime. Life as a shopping cart: it’s no piece of cake. 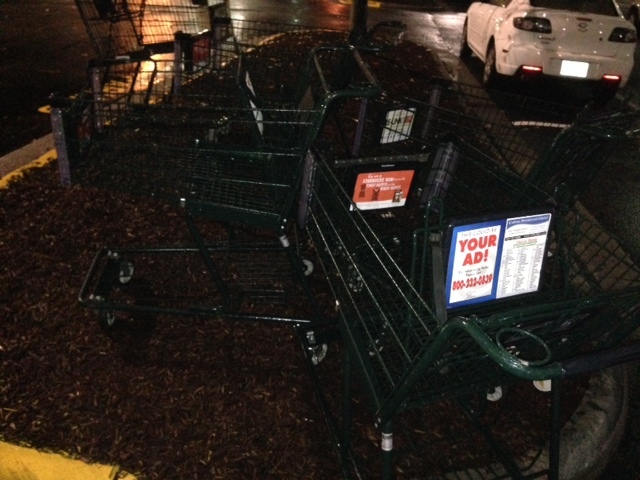 Why do people abandon their shopping carts all over parking lots? 1. They want to make a video when the speeding cart aces the side of someone’s new Porsche at the bottom of the hill. 2. They have an urgent appointment with the driver’s seat, and besides, fresh air makes them dizzy. 3. They can’t find the cart corral because it’s on the ground right next to their 3-story SUV. 5. They see it as an existential issue: they think it gives the poor guy patrolling the lot on foot for stray carts a reason to live. 6. It helps them feel young and free and irresponsible. 8. They think as long as the cart wasn’t moving when they released it, it’ll stay there. What are those little round things on the bottom, anyway? 9. They’re honing the art of letting go. 10. It’s the law at Wal-Mart. More on shopping carts from a friend who’s quite gifted with her camera and in her imagination. Aside | This entry was posted in Humor, Loneliness, Love. Bookmark the permalink.